If self-driving cars really do take over our roads then things are going to be a lot safer — at least for people inside them. Vehicles will be able to constantly communicate with one another to prevent crashes, but what about those poor, unconnected humans? Or humans who might wander into traffic by accident, or decide to test the reflexes of Mr. Robo-Car for fun? Well, Google’s self-driving spinoff Waymo has one potential answer: softer cars. As spotted by The Mercury News and Quartz, Waymo recently patented a car design in which the vehicle is held together internally with a number of “tension members.” These members — which could be cables, rods, or springs — would slacken or tighten to adjust the car’s “external rigidity” as needed. If sensors detect the vehicle is about to “come into contact with another object” they would change accordingly. If it’s another car, keep the outside stiff; it’s a human, loosen up as appropriate. An illustration from the Waymo patent. The horizontal lines represent the adjustable “tension members” that would loosen or tighten to change the external rigidity of the car (the thick line). 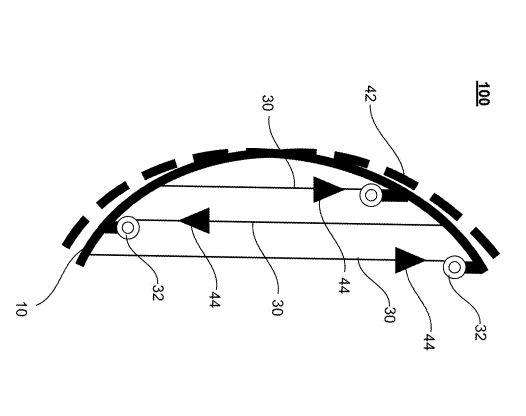 “For example, if it is determined that a bicyclist is about to strike the hood and front bumper of the vehicle, the tension may be reduced for the tension members associated with the hood and front bumper, so as to reduce the rigidity of those surfaces,” says the patent. The end result would hopefully be a lighter impact for those hit by the car. Think of it like a metal beanbag that crumples to accommodate a new, unexpected passenger. Of course, the usual caveats for patents apply here. This is nothing more than a particularly detailed back-of-the-napkin sketch at this point. There are no tests showing whether such a system could help save pedestrians’ lives, or whether it would even be safe for people inside the vehicle. But at least it’s more sensible than one of Google’s earlier ideas for protecting walkers from self-driving cars: covering the outside of the vehicle with adhesive to ensure anyone it collides with doesn’t fly off and hurt themselves.